Share offer closes 2 days early, raising over £335,000! We are delighted to report that on 23rd September 2016 our second community share offer reached its target raise of more than £335,000, in the end closing two days early due to oversubscription. All the PV systems which were planned to be purchased with the money have been installed, commissioned and registered for the Feed-in Tariff (FiT) and all this achieved before the FiT rate dropped on 30 September. The PV systems have been installed on seven properties belonging to the University Hospitals of North Midlands NHS Trust (including Stafford and Royal Stoke hospitals), and on St Giles Hospice, Whittington, the latter being in addition to those already owned by SSCE there. The primary reason for the installations, after saving CO2 emissions, is to enable the establishment of a scheme, with the surplus, to help those in the area affected by health conditions related to fuel poverty. Consultants in A&E will identify those people who continually present there with such health conditions and will request the patients’ permission to refer them to fuel poverty charity, Beat The Cold, who will then help the patient address as many factors as possible that are contributing to their inability to maintain a warm, dry home. While the first year’s FiTs are building up, we are delighted to say that this community work will be launched with the £10,000 proceeds resulting from the scheme’s winning first prize in NEA’s Energy Impact Awards 2016. We are overjoyed at getting to where we are, and are catching our breath for a while, but nevertheless we will post updates on the progress of the community work here when we have them, so do come back and see how we are getting on. Many homes in this area are of solid wall construction. Solid wall homes are often poorly insulated and lose a high proportion of their heat through the walls. There is now an increased focus on insulating solid walls, and the Government’s Green Deal scheme and ECO subsidy are designed to encourage this practice, alongside other energy efficiency measures. To help residents of Lichfield to understand more about it, Southern Staffordshire Community Energy and the Energy Saving Co-op were asked by Lichfield District Council to commission a video showing how solid wall insulation works and how to identify a solid wall property. The video was funded by the Department of Energy and Climate Change through its Green Deal Pioneer Places project and produced by Armoris Video. The partnership also delivered 4 solid wall show homes across Lichfield: several of these are featured in the video. If you live in a solid wall property and would like to further help on insulating it please contact Kate Sadler on 07565 963282. We may also be able to arrange for you to visit a solid wall property that has already had external or internal insulation installed. The second of our training sessions will run on Wednesday 24th April and cover Renewable Energy. It will be held at Curborough Community Centre, Lichfield and led by Richard Davies MBE, the director of the local sustainable energy charity Marches Energy Agency. The session will focus on the smaller scale technologies suitable for homes, community buildings and neighbourhoods and will give you the basics of what you need to know to be able to act be a first point of contact within your community and local networks. Looking at heat pumps, solar photovoltaics, solar water heating, wood fuelled heating and small wind turbines the training will equip you with the basics and help you decide which technologies suit which situations. In addition to giving you the technology basics the training will help you navigate the financial support mechanisms that are available including the Feed in Tariff and Renewable Heat Incentive. Contact Kate Sadler via katesadler@talktalk.net or 07565 963282 if you would like to book on. 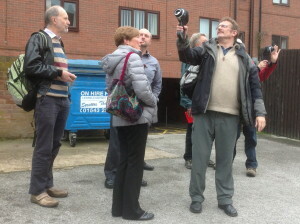 The first training session on the Green Deal and ECO, held on 27th March, was very useful and it is hoped that attendees will be able to pass on their knowledge to others in the community, and encourage uptake of Green Deal to help create more sustainable homes in the locality. Low carbon groups meet the Secretary for State, Ed Davey. 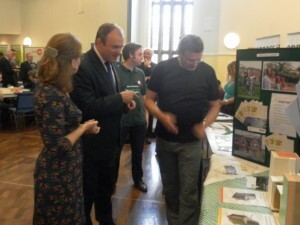 Robin Tasker (left) and Kate Sadler (centre) meet Ed Davey, Secretary of State. 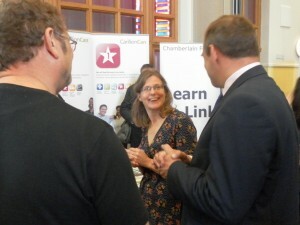 Low carbon groups met Ed Davey, the Secretary of State for Energy and Climate Change at an event in Birmingham on 6th May. 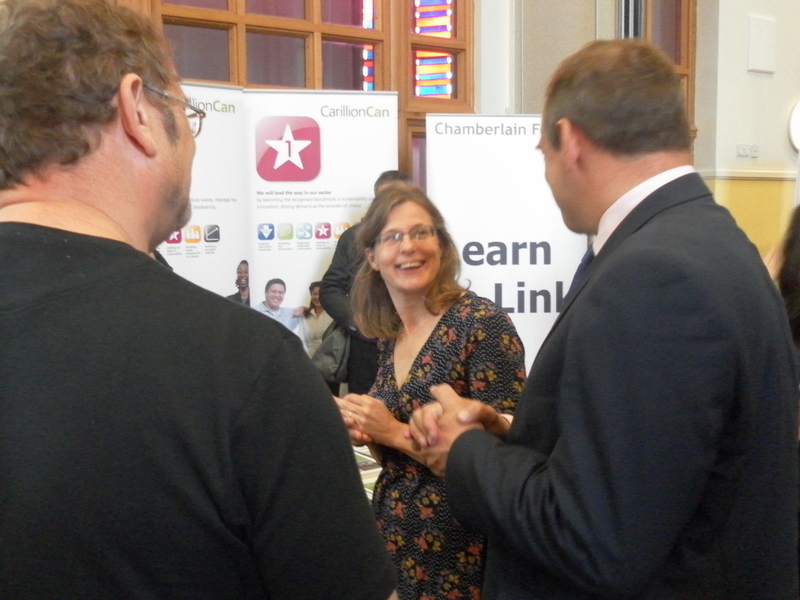 Kate Sadler and Robin Tasker represented Southern Staffordshire Community Energy, Whittington and Fisherwick Environment Group (WFEG) and Low Carbon Lichfield (LoCaL). A discussion of projects completed by SSCE, WFEG and LoCaL and a chance to raise our concerns with the Green Deal process. The event was set up so that the Secretary for State and the Cabinet Member for Health and Well-Being, Steve Bedser, could meet with social enterprises and community groups to discuss how such groups can support the roll out of the Green Deal and play an active role in tackling fuel poverty and the ill-health associated with cold homes. The Green Deal is the Coalition Government’s initiative to support the implementation of energy efficiency measures to households and businesses without the need for upfront costs and is due to be introduced later this year. SSCE, together with WFEG and LoCaL, is committed to helping our communities receive high quality energy efficiency services that result in significant economic and carbon savings. The groups are keen to see that the Green Deal infrastructure will leave opportunities for smaller local businesses to get involved. SSCE highlighted the need for Green Deal property assessments to be carried out by independent assessors and that the work carried out under the scheme is tailored to individual households. Posted in Uncategorized	| Comments Off on Low carbon groups meet the Secretary for State, Ed Davey. Two PV systems up and generating and share issue imminent! With a 18kW system installed at St. Giles Hospice and and an 8kW system installed at the Whittington Village Hall, the share issue to raise the capital for these schemes opens on the 18th January. The share prospectus will be available from our website. Posted in Uncategorized	| Comments Off on Two PV systems up and generating and share issue imminent! Posted in Uncategorized	| Comments Off on PV installations imminent! Planning permission has been granted for a 50kW and a 10kW PV schemes on two community buildings in Whittington. Another step completed! Posted in Uncategorized	| Comments Off on Installer selected for our PV projects! Find out more about investing in SSCE! Come along to the Low Carbon Lichfield (LOCAL) stall at the farmers market on Thursday 1st August to find out more about investing in SSCE. Posted in Events	| Comments Off on Find out more about investing in SSCE!